The humming heart of Figures of Speech is protected by several Uninterruptible Power Supply (UPS) devices. They not only monitor and smooth the voltage coming from the public electricity supply, they also protect our computers from frequency variations. Electricity consumers without a UPS would not notice such variations: most electric devices will continue to work normally, lights won't flicker and so on. Our UPS devices, though, aware of the great quality and value of the work they are guarding, take these variations seriously, switch over to battery backup and issue an alarm. The switchover is quite noisy but fortunately usually very brief – only the equally brief burst of beeping and the sound of clunking solenoids irritates. Three scared UPS boxes beeping and clunking in unison can be quite irritating, especially when they go off exactly on the hour or on the half-hour several times a day. The only consolation is that we know they are working properly when they get tested so frequently. It got so bad on occasions we even considered switching our UPS off, just for a (risky) bit of peace and quiet. The beeping was due to what the Swiss power supply people call a 'Smart Grid'. Not without some irony, for it was anything but smart from the point of view of our UPS systems. When the frequency of the supply grid goes outside the quite tolerent limits of our UPS devices then something is seriously wrong. It is, in fact, the grid from Hell. The smart grid is necessary to be able to cope with the new era of electricity generation, with fewer and fewer inertial generators with their frequency stabilising effect and more and more bits and pieces of electricity coming from many other erratic sources –	a bit of solar here ('Sometime too hot the eye of heaven shines, And often is his gold complexion dimmed […] By chance or nature’s changing course untrimmed'), a bit of wind there if you are lucky ('Down dropt the breeze, the sails dropt down'), a bit from the odd refuse incinerator, something from a hydroelectric pump-storage set-up and a bit from multiple interconnectors with multiple countries. Oh, and some from the local hospital's backup diesel generator if you're really in a bind. Confronted with this MENSA entry test every few seconds the poor old smart grid is using all its brain cells switching between power sources and trying to keep the whole caboodle at some sort of orderly, synchronised frequency. If the frequencies of supply are not aligned by even small amounts, things go seriously wrong. Voltage and current can be jumbled up to some extent, frequency cannot. However, a few months ago our UPS devices stopped beeping almost completely. Three containers full of lithium-ion batteries and associated conversion and cooling equipment. Image: EKZ. 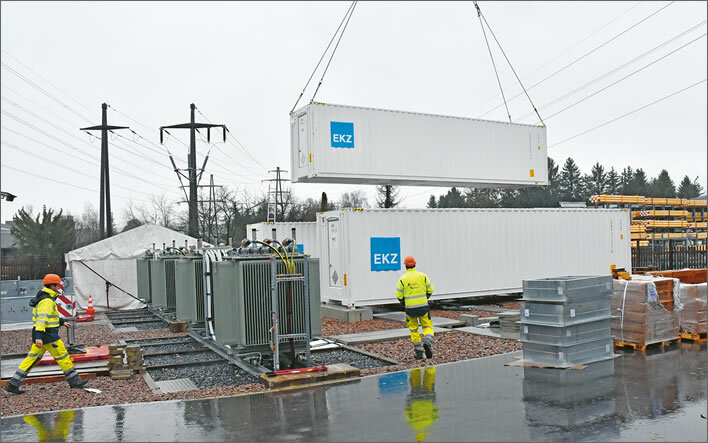 The reason seems to be that our electricity supplier had spent a project total of 6 million CHF to stack up enough lithium-ion batteries in three shipping containers to produce a system that can supply 12 MW (18 MW for short periods) with a capacity of 7,500 kwH. The batteries are predicted to have a minimum life-span of ten years. Putting it all together. Image: EKZ. Grasping for some way to make these figures comprehensible to the laiety, the power firm tells us that 7,500 KWh is the equivalent of 100 Tesla-S batteries or 1 million iPhone-8 batteries. Geddit? No, of course not. But you really need to know that 18 MW is enough to power 10,000 hairdryers – for a very short while. These numbers are completely irrelevant anyway, because the battery installation is not a reserve source of power but rather is intended to smooth out and balance all the unsavoury happenings in the current electricity supply network. Well, it's working – at least our UPS devices think so. They still fire off now and again, but much less frequently than before. This calming of the problem may also have been due to the resolution of some European frequency difficulties, since the whole of the Central European power supply is synchronised to the same frequency. 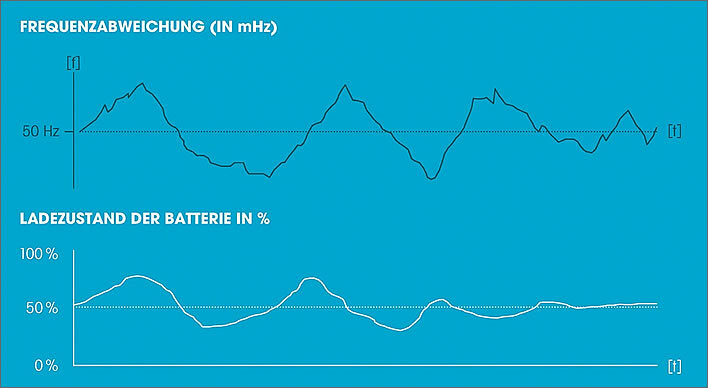 The batteries charge themselves during overproduction (frequency too high) and supply power during underproduction. Since frequency errors still occur from time to time we can assume that this diagram is misleading or not telling us the whole story. We are told that the capacity of the system is 7,500 KWh, but is this the 100% capacity or the 50% capacity? 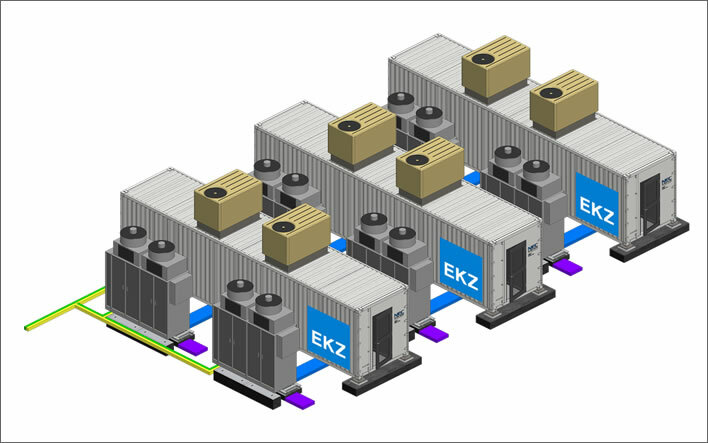 The batteries are only capable of delivering 50% of their total capacity because their base charge can only 50% in order to allow for the take-up of surplus electricity. Perhaps you ought to think about such things before you use your hairdryer. Image: EKZ. Whether one should be producing electric power in such a way that the distribution network is fundamentally unstable is another question. We can guarantee that with the current energy policies in Switzerland – an insane and expensive dash for solar, wind and pixie dust – the network will only become even more sensitive and that sticking plasters such as this pile of batteries will also begin to peel off. Our electricity bills show more and more of our money having to be spent on the supply network rather than the electricity it supplies. This is misleading, because we are silently paying more and more to subsidise creative but uneconomic forms of power generation through general taxation, which then have to be balanced out by an increasingly fraught distribution network.